Sure, I’ve been critical of Donald Trump and the appalling things that regularly fall out of his mouth. (Check here, here and here.) I have a hard time of envisioning government by temper tantrum and wholesale character assassination. But I’ve also written about Hillary Clinton. About the curious timing of hubby Bill’sprivate meeting at Sky Harbor with Attorney General Loretta Lynch, who oversees the agency that was, at the time, investigating Clinton’s wife. About the FBI’s announcement a few days later that Hillary Clinton was “extremely careless” in her handling of state secrets on her private email server. This, despite Clinton’s repeated public assurances that no sensitive material was ever stored on her private email server. So naturally, I must be a Trump supporter. “I guess you are one of those women who just can’t stand to see other women succeed,” wrote one reader. Actually I’m one of those Americans who just can’t stand of think of either Hillary Clinton or Donald Trump as our next president. Turns out there are a lot of us. According to the latest CNN poll, 55 percent of American voters have an unfavorable view of Clinton and 70 percent don’t like Trump. We don’t buy Trump’s fear and anger and we don’t trust Clinton’s hope and change – or rather, a lack of change from what we’ve seen over the last eight years. Actually, there are two. We just don’t see or hear much about them. Former New Mexico Gov. Gary Johnson is a Republican-turned-Libertarian who might appeal to Republicans who support free trade, entitlement reform and tax cuts. Democrats might like his support for legalizing marijuana and Obama’s deportation reprieve for immigrants who were brought here illegally as children. Jill Stein is the Green Party candidate who might appeal to Democrats who support single-payer healthcare, a $15-an-hour minimum wage and free child care and college. Both ran for president in 2012. Neither got even 1 percent support. Both are running again – not that you’d know it. Next month, the presidential debates will begin and neither will likely be on the stage. The Commission on Presidential Debates has decreed that a candidate must hit an average of 15 percent support in five national polls. Johnson wavers between 7 and 13 percent, depending upon the poll. But how do you get support if nobody knows who you are? How can voters, unhappy with a choice between Trump and Clinton, realize there’s a third option if they turn on CNN (or FOX) and it’s all about Donald’s mouth and Hillary’s email? The commission should reconsider its 15 percent rule and offer Johnson a place at the podium. 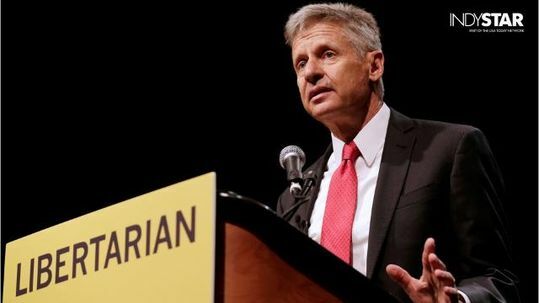 As the leading third-party candidate, surely he deserves the chance to make is case to voters. Surely, voters deserve a chance to hear it.